The mouth can tell a lot about your health. One good example is through oral thrush—also called oral candidiasis and oropharyngeal candidiasis. It is a condition where the fungus Candida albicans is overgrown in the mouth and throat. Fungus is also known as yeast. You see, fungus will live in the mouth. In normal amounts this is perfectly harmless; however, when there is fungal accumulation, it can spread throughout your mouth, including your gums, inner cheeks, back of the throat, tonsils, and roof of your mouth. Oral thrush is most common in infants and older adults, but it will affect anyone with a weak immune system. The condition can be spread from person to person. Newborns will get oral thrush during birth, while adults will pass it through saliva. Many people may be unaware they have oral thrush. That is until they open their mouth and see an unpleasant white and creamy film on their tongue. A white coating or lesions on the tongue can be very painful; they will even bleed when aggravated by the teeth, a toothbrush, or food. These lesions will appear raised, and look like cottage cheese. There may also be severe soreness or redness that can cause problems swallowing or eating. Light bleeding will occur when the lesions are scraped or rubbed. You may also experience a dry mouth with bad breath, loss of taste and a weird cottony feeling in your mouth. Infants with oral thrush will experience irritability, fussiness, and difficulty feeding. Oral thrush can also be a sign that candida is going on throughout the body as well. For instance, women may experience vaginal yeast infections and infants may have a diaper rash. Other people may have systematic candida; this is where the fungus spreads throughout the entire body and dramatically weakens the immune system. For those with weakened immune systems, like cancer patients, the fungal overgrowth will even poison the blood. Other symptoms of systematic candida include diarrhea, constipation, colitis, abdominal pain, persistent fatigue, rectal itching, arthritis or muscle pain, canker sores, kidney and bladder infections, depression and anxiety, congestion, coughing, headaches, numbness or limb tingling, poor memory or concentration, chronic skin rashes, allergies, and toenail or genital fungus. Impaired immune system: An impaired immune system is likely the main cause of oral thrush. This is why the elderly and infants are more susceptible to the condition. A thickly coated tongue will indicate bacterial imbalance and poor gut function. This is important since 70% to 80% of the immune system is located in the gut or digestive system. Oral thrush will also appear in others with serious compromised immune systems like those with human immunodeficiency virus (HIV)/acquired immunodeficiency syndrome (AIDS) or people undergoing chemotherapy. Medications: There are certain medications that can disrupt the balance of fungus in the mouth. As a result, candida overgrowth will cause oral thrush. Medications that can disturb that balance of microorganisms in the mouth include corticosteroids, birth control pills, and antibiotics. Probiotics will help balance and offset the harm caused by the medications. Diabetes: People with diabetes are also more likely to have oral thrush. Sugar feeds on yeast, and people with uncontrolled or untreated diabetes have high amounts of sugar in their saliva, which encourages candida overgrowth. In a 2012 study published in the Indian Journal of Endocrinology and Metabolism, researchers suggested that diabetic patients have greater susceptibility to infections, especially since a hyperglycemic environment causes immune system impairment. Denture wearers: Cracking and redness at the corners of the mouth is also common, especially in those who wear dentures. Bacteria, plaque, and sugar will accumulate on dentures and allow for candida to spread. Cancer treatments: Cancer patients have a greater risk of candida infection since the treatment and disease allow the spread of fungus and bacteria to wreck havoc in the body. Chemotherapy and radiotherapy will cause dry mouth, which increases the chance of oral thrush. A study published in the Journal of Infection found that candida is a serious problem in cancer patients and treatments. For the study, 74 of 224 patients treated for cancer had also been diagnosed with candida. 1. Coconut oil: Coconut oil is a powerhouse food against candida and oral thrush. The combination of caprylic acid and lauric acid is known to kill harmful candida. In a 2007 study published in the Journal of Medicinal Food researchers suggested that coconut oil could treat fungal infections. The lauric acid converts to monolaurin, which is helpful for killing viruses, bacteria, and fungus. The best type of coconut oil is the organic virgin variety. In a 2008 study published in the Indian Journal of Dental Research, researchers found that coconut oil pulling can create a clean antiseptic environment in the mouth. It will also detoxify the oral cavity. Coconut oil pulling is easy. Simply swish one to two tablespoons of coconut oil in your mouth for 10 to 20 minutes. Don’t swallow it since it contains toxins and bacteria from the swishing. Spit out, and immediately rinse your mouth with warm water. Complete the coconut oil pulling procedure by brushing your teeth. 2. Fermented vegetables/probiotic foods: Fermented vegetables and probiotic foods can help boost the microflora in the body and strengthen the immune system. Add some kimchi to the diet. It is full of fermented cabbage and other vegetables. Sauerkraut is another probiotic food that can balance the bacteria in your body and mouth. Cultured and high probiotic dairy like kefir can also help kill candida and balance bacteria when consumed in moderation. 3. Cinnamon: People are thought to suffer less candida overgrowth when they supplement with cinnamon in the diet. In a Brazilian study published in the journal Mycopathologia in 2011, cinnamon oil showed anticandidal activity. As a result it can be effective in the control of oral thrush. 4. Warm starchy vegetables: Several warm and starchy vegetables can help support the spleen by clearing candida in the body. Some good anti-candida vegetables and foods include carrots, kohlrabi, rutabaga, spaghetti squash, zucchini, lentils, adzuki beans, and mung beans. 5. Bone broth: Beef or chicken bone broth is the ultimate food remedy to improve the digestive and immune systems. In turn, this can help improve the health of people with oral thrush or candida. Purchase organic beef or chicken bones from your local farmer. Heat them in the oven for about 30 minutes and then let them sit in a pot of filtered water for another 20 minutes with apple cider vinegar. Add vegetables and herbs, and bring to a boil. Reduce to a simmer and let sit for 24 hours for chicken bones and 48 hours for beef bones. There are certain antifungal drugs on the market; however, repeated use of these medications can cause resistant-strains to fungal pathogens, including those that cause oral thrush. Luckily, there are also several natural remedies for oral thrush. 1. Caprylic acid: Studies have found that fatty acid found in coconut oil contains natural yeast-fighting properties. Caprylic acid can kill candida yeast cells, detoxify the digestive tract, and speed the healing process from an oral thrush infection. In a 2011 study published in the journal Acupuncture & Electro-therapeutics Research, researchers confirmed that caprylic acid can reduce symptoms linked with fungal infections, including candida and oral thrush. 2. Milk thistle: Milk thistle is a supplement that cleanses the liver from harmful medications that contribute to oral thrush, such as birth control pills, antibiotics, and corticosteroids. Milk thistle should be used during the kidney and liver detoxification stage of your anti-candida protocol. It also helps cleanse and detoxify the body of heavy metals and internal pollutants that contribute to a weak immune system. 3. Natural antibiotics: Antibiotic drugs can contribute to oral thrush, but natural antibiotics will help strengthen the immune system and fight candida infections like oral thrush. For example, the allicin in garlic has antiviral, antibiotic, and antifungal properties. Oil of oregano has antifungal, antibacterial, antiviral, and anti-parasitic properties. Colloidal silver is also an antiviral agent that boosts the immune system. Besides oral thrush, these natural antibiotics will treat other fungal infections like systematic candida or vaginal thrush. 4. 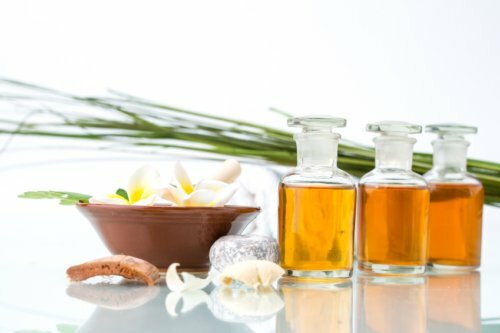 Essential oils: Essential oils are also great in oral thrush natural treatments. For instance, clove oil is one of the more powerful essential oils for treating the candid infection. A study published in the journal Mycobiology in 2007 found that clove oil was as effective as the common oral thrush drug called nystatin. Oregano oil is also effective at killing infections, viruses, and bacteria in the body. A study published in the Brazilian Journal of Microbiology in 2010 found that oregano oil also has antifungal properties that are effective against oral thrush. Myrrh oil can also kill fungus and parasites. A 2012 study found that the herbal combination of toothpaste with myrrh, chamomile, and sage can reduce inflammation and improve immunity. As a result, the toothpaste could effectively control oral thrush. 5. Other herbal remedies: Herbal remedies for oral thrush include black walnut, wormwood, peppermint, Oregon grape, rosemary, grapefruit seed extract, tea tree oil, reishi mushroom, dandelion tea, and pau d’arco. Pau d’arco tea or supplements have strong antifungal and antibacterial properties. It is good practice to drink several cups of pau d’arco tea daily with any candida infection, especially oral thrush. There are also other quick tips and oral thrush natural treatment and prevention methods. Change your toothbrush every week or two. Fungus will build up on your toothbrush, and it will likely change color. When sleeping, it is a good idea to remove dentures from the mouth to give the mucous membranes in the mouth recovery time. After meals floss and scrape your tongue with a copper or metal tongue scrapper. It is also best to avoid mold-containing foods that contribute to the oral thrush, such as mushrooms, pickled foods, dairy, and some nuts like cashews and pistachios. Always avoid processed and refined sugary foods, which help feed candida overgrowth. Eat fruit and natural sugars like honey in moderation. For any type of candida cleanse or treatment, you may experience various symptoms like dizziness, fatigue, gas, bloating, and impaired brain function. These are signs that candida is leaving your body, and they should clear up within a week to 10 days. Afterward you will feel more focused and energized. DiNubile, M.J., et al., “Invasive candidiasis in cancer patients: observations from a randomized clinical trial,” The Journal of Infection, 2005; 50(5): 443-449. Casqueiro, J., et al., “Infections in patients with diabetes mellitus: A review of pathogenesis,” Indian Journal of Endocrinology and Metabolism, 2012; 16(Sippl1): S27-S36. Ogbolu, D.O., et al., “In vitro antimicrobial properties of coconut oil on Candida species in Ibadan, Nigeria,” Journal of Medicinal Food, 2007; 10(2): 384-387. Youn Chee, H., et al., “Antifungal Activity of Clove Essential Oil and its Volatile Vapour,” Mycobiology, 2007; 35(4): 241-243, doi: 10.4489/MYCO.2007.35.4.241. Brum Cleff, M., et al., “In vitro activity of origanum vulgare essential oil against candida species,” Brazilian Journal of Microbiology, 2010; 41(1): 116-123, doi: 10.1590/S1517-83822010000100018. Pires, R.H., et al., “Anticandidal efficacy of cinnamon oil against plaktonic and biofilm cultures of Candida parapsilosis and Candida orthopsilosis,” Mycopathologia, 2011; 172(6): 453-464, doi: 10.1007/s11046-011-9448-0. Adwan, G., et al., “Assessment of antifungal activity of herbal and conventional toothpastes against clinical isolates of Candida albicans,” Asian Pacific Journal of Tropical Biomedicine, 2012; 2(5): 375-379, doi: 10.1016/S2221-1691(12)60059-8. Omura, Y., et al., “Caprylic acid in the effective treatment of intractable medical problems of frequent urination, incontinence, chronic upper respiratory infection, root canalled tooth infection, ALS, etc., caused by asbestos & mixed infections of Candida albicans, Helicobacter pylori & cytomegalovirus with or without other microorganisms & mercury,” Acupuncture & Electro-therapeutics Research, 2011; 36(1-2): 19-64. Nordqvist, C., “Oral Thrush: Causes, Symptoms and Treatments,” Medical News Today web site, July 6, 2015; http://www.medicalnewstoday.com/articles/178864.php. “Dental Health and Thrush,” WebMD web site; http://www.webmd.com/oral-health/guide/dental-health-thrush, last accessed December 14, 2015. Asokan, S., “Oil pulling therapy,” Indian Journal of Dental Research, 2008; 19(2): 169. “What Is Oral Thrush?” Healthline web site; http://www.healthline.com/health/thrush#Overview1, last accessed December 14, 2015.